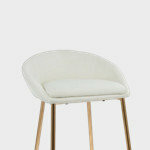 Prices range depending on the scope of your project. 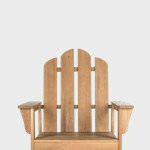 Once a detailed design is complete, exact prices can be estimated. Amazing Basement Creations specializes in the art of designing and finishing basements with the objectives of our clients in mind. The stated goal of Amazing Basement Creations is to make your basement feel like an extension of your living space and to help you build equity in your most valuable possession, your home! 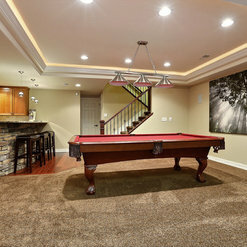 Here at Amazing Basement Creations we pride ourselves on our state-of-the-art designs, quality workmanship, superior customer service, and of course our amazing basements! We currently serve Denver, Colorado and it’s surrounding areas. 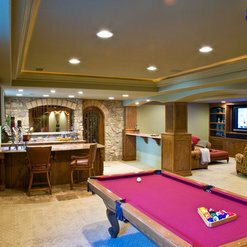 A basement design is critical to ensuring that you get what you want out of your project. Our design experts have years of experience and can offer you advice on how to best use your space. You and your family will be inspired to spend more time in a space that’s designed just for you. 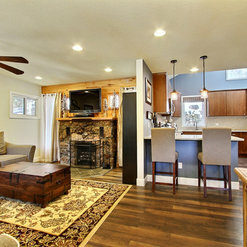 Licensed with references, 26+ years of experience, and over 1,480 completed basement remodels in Colorado. I first contacted Zach with Amazing Basement Creations back in 2016 when we Bought our house. He came out and designed a plan and gave us an estimate. Well the estimate ran a little too high for us at the time and we said we'd have to hold off and save some more before we can embark on our project. Zach was very understanding and let us know that he could do any or all of the construction and finish work. We had a few changes to our plans over the next 2 years. In June 2018 we let Zach know that we were ready to move forward with our kitchen remodel. We knew that we wanted to have that" look what we've done with our kitchen" so we asked Zach to do all the demo, add a gas line, move the water, design our electricity plan and install as well as add a wall and bring the entire project through drywall with the electricity in place. 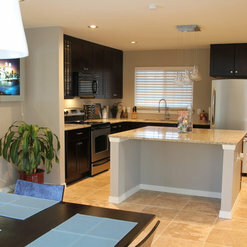 We would then take over and do all the finish work and the overall aesthetics of the remodel. We knocked down 2 walls removed the kitchen pushed the kitch back through the dining room and add a wall to create a dining kitchen living-room open concept. Well you couldn't ask for a more professional company to trust with your house or your hard earned money? We settled on a price, a time schedule and a payment plan. Nothing came as a surprise. The sub-contractors were top notch and treated our house as if it was their own! James our Project manager from Amazing basements was on top of everything and let us know when there would be a delay or to our amazement that some contractors would actually be out early to do their work. Our project went smoothly and they even completed all their work 2 weeks early! My husband David (along with some friends) completed the rest of the work. Flooring, cabinets, back splash, and counter tops. Of course we had a granite company install the island top & a friend of ours painted. Mind you Zach and James were always a phone call away helping us solve glitches that came up along the way. Amazing Basement creations did all the hard work!! We just made it look pretty. If you really want a professional, courteous, knowledgeable contractor to do your home remodeling don't look any further this is the company you can trust and have a great working relationship with. I wish I could upload more than 4 pictures because these don't do the job justice. It was so much more than this! Artistic Floors by Design, Inc.
My husband (Joe) and I have owned our own wood floor contracting business in the Denver area for 13 years (Joe has worked in the wood floor industry in Colorado since 1991). There are contractors working in the local construction industry who give the rest of us a bad name; however, Amazing Basement Creations is an ethical and professional home remodeling company you can trust. We have worked with Amazing Basement Creations previously and appreciate both Zach and James (cofounders of Amazing Basement Creations) and their respect for specialty trades contractors and homeowners. They're able to communicate clearly with both parties involved in the remodeling process--trades that are doing the work as well as the remodeling homeowners. 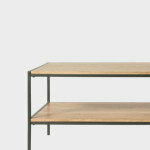 They are on time, provide a fair price, and manage expectations about what can be done and achieved in a space. I've seen a variety of homes in which they've completed great work and when I have the need to hire a general contractor for my own personal home remodeling project, I will hire Amazing Basement Creations. I highly recommend ABC. They had the measurements and estimate done within a week. We had the sewer line and plumbing moved for the bathroom, tray ceilings with LED lights installed to give the whole basement more height (turned out awesome). Framer finished in three days. We wanted some things changed, Zach and Mike had no problem accommodating us. Plumbers, Electrians, Framer and HVAC guys where excellent. We definitely have the best basement in our neighborhood. Can't wait for our open house. 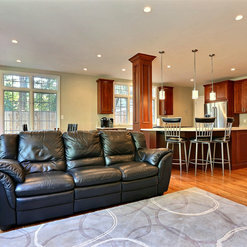 They acted as the general contractor for finishing our basement, and their sister company designed the layout. The design ideas they presented were excellent and ones that I never would have considered. Our basement is amazing! 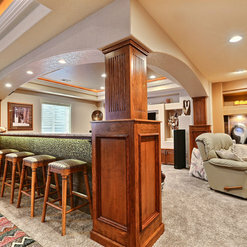 Searched for several months trying to find a contractor when Amazing Basement Creations was recommended to us from one of my former employees. They loved the work done on their basement and the process of the design work and the build and they knew our tastes and insistence on high quality. We called them and set up an appointment to discuss our needs. We were immediately contacted and we decided to work on a design with them (done on-line in the evenings when could both be on the call). They collaborated with us on the flow, our ideas, and supplemented the design with a great design that we immediately fell in love with. They provided a detailed blueprint from which we could bid the project, one of which was a bid they were interested in as well. We selected Zach and his team and immediately set up a schedule with milestones and a budget to work with. They employ their own subs their projects and it allows them to follow a tight schedule. It also allowed us some flexibility to put additional funds where we wanted to upgrade materials or fixtures as well as trim costs, and finally to employ our own subs for certain finish work (as long as they could work within the established schedule). As different stages of the work were completed, we made some changes that really made the project turn out even better than we had originally planned or could have imagined. The project was scheduled for 3 months and it took about 4 months due to some of the changes that we wanted. Finally we tagged on finishing a space with a small wine room, which added another month to the complete finish. We have a beatiful basement that includes a library, game room, wet bar, craft room, workout area with sauna, bathroom, and two hidden doors to store rooms. 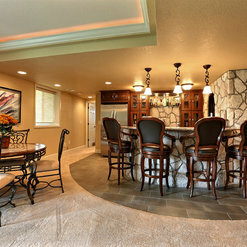 The workmanship is incredible and is the like our own private oasis while also being perfect for entertaining. We feel like we have made new friends and would highly recommend any of their subs for the professionality and skills. We love to show our before and after pictures and have made recommendations to several folks that are looking at doing their basement in the next few years. They definitely come by their name honestly because "Amazing" is how most people describe the final finish. Zach and team easy to work with from start to finish. Takes his job and client satisfaction seriously. His attention to detail is amazing. Every recommendation he made turned out beautifully. I wish I could have him build me a cabin in the mountains! 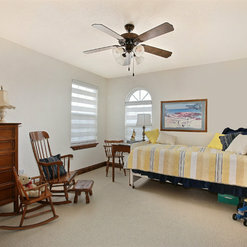 Susie, Golden CO new 2 bedroom, bath, laundry, den basement and full upper condo remodel. 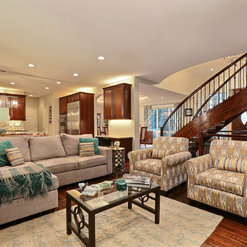 Amazing basements was responsive and organized from my initial contact with them to completion of the project. Zach and Scott were very communicative throughout the entire process, something that most companies in this industry lack. The attention to detail was excellent and the professionalism was top-notch down to each sub-contractor that came into our home. They were very flexible to our design changes as well as scheduling restrictions for our young daughter. 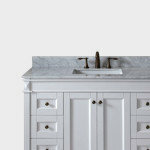 I can't recommend this company enough, not only for design, but construction as well. When we decided to finish the basement I never dreamed that it would look so good when it was completed. Zach and his team were able to layout a plan that included everything we wanted. Attention to detail was always a priority when it came to the work. I was told when people would be working and never sat around waiting. All the subs working to complete the job were polite, on time and knowledgeable. The finished product looks like the it was part of the original build. I would recommend Amazing Basement Creations again in a second. We suffered severe damage from the famous Boulder floods of September 2013. Our entire basement was gone, which included a family room, bathroom, laundry room and 2 bedrooms. We took the opportunity to, not only rethink our basement layout, but our master bedroom and bath on the main level also. Amazing Basements was great at helping us thru the design process. The actual construction project is where it really matters. In my opinion, it comes down to the subcontractors. I believe ABC has done a good job vetting them and having subs that are good at what they do, know their trades, and are reliable. We love our new space! Amazing Basements is just that, Amazing. My wife and I knew exactly what we wanted and the finished product resulted in something more exceptional. In the beginning, we had initially focused on cost, but soon realized we needed to work with an expert and with a company that specializes in basement design and construction. We both run full-time business and we knew we did not have the time to be a general contractor. Zach and his crew communicated every step of the building process including personal introductions to each sub contractor. After all, these were strangers working in our home, and Amazing Basements helped make them feel like family. At times we did not even know they were there. There was never a problem with dust or trash. When it came time to order and install permanent fixtures, Zach and each subcontractor reviewed the plan once again and gave us opportunities to make changes as we saw fit. Lastly, their integrity is top notch. Their word was their word, and their communication was immediate. 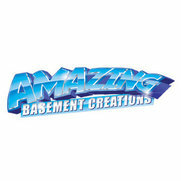 Thank you Amazing Basements for such a great product and experience. Your work is seen and experienced by our family and friends on a daily basis. 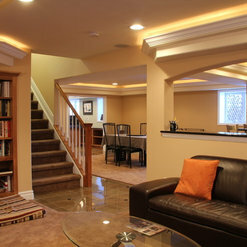 Amazing Basement Creations (ABC) remodeled our 2000+ sq.ft basement. I had multiple quotes and ABC was not the cheapest but delivered a quote that I had more confidence in. A project of this size and relying on the professionalism of a multitude of contractors, you will always encounter a few bumps along the way, which we did. But all you can ask for is a company that addresses these issues as and when they are encountered. ABC delivered a basement which we are very happy with, and to the level of specification I requested.